On Saturday, a group of illegal Israeli colonizers, accompanied by soldiers, invaded the markets’ area in Hebron’s Old City, in the southern part of the occupied West Bank, while the soldiers installed roadblocks and abducted an employee of the Waqf and Islamic Endowment Department. Media sources in Hebron said the colonizers invaded and marched through the markets’ area of the Old City, blocking Palestinian traffic and pedestrians, and verbally harassed many merchants and children. 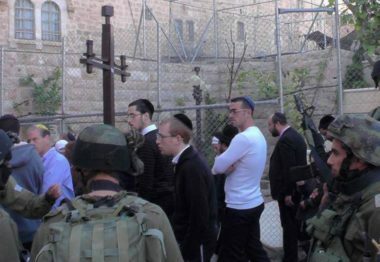 They added that the soldiers abducted an employee of the Palestinian Waqf Department in Hebron, identified as Islam Rateb Zahda, 28, after stopping him near a gate leading to the Ibrahimi Mosque. In addition, the soldiers invaded Tarqoumia town, west of Hebron, and searched the home of Mohammad Ali Fatafta, causing property damage.